All you wanted to know about Japanese money but were afraid to ask. Japanese money is probably one of the most important things you need to know about before planning a trip here. Everything costs something, after all, and we all want to try the sashimi and pay to visit the temples and shrines. 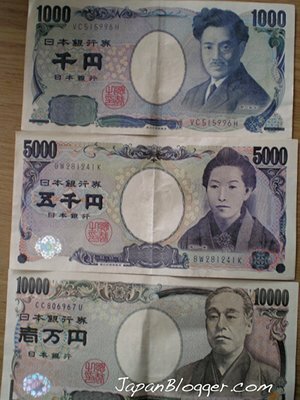 Therefore, it is useful to take in a few facts about Japanese money. The currency of Japan is the yen. The symbol used for this is: ¥. If you can't see that, it is a capital "Y" with two horizontal lines through it. When handwritten, people often also use a lower case "y" with two lines thru that, so be aware you might see this sometimes. Everyone knows that, but I wanted to mention it anyways. This is actually the kanji for yen, pronounced "en". You will see it everywhere, so you should get used to it. First things first: Japanese money uses 6 coins and 4 bills, and one of those bills is relatively rare, so you may never see it. The numbers indicate the values. 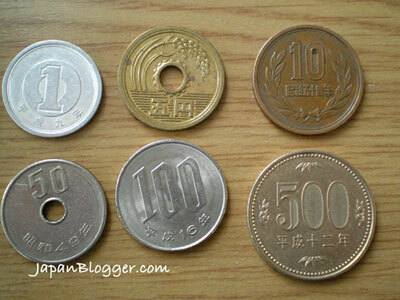 The only exception is the 5 yen coin, that one in the top row with the hole through the middle. For reasons I don't know, it uses kanji for the number. The kanji for 5 is 五, pronounced "go". As you can see, we have coins for 1, 5, 10, 50, 100, and 500 yen. As you can see, bills come in 1000, 5000, and 10,000. Not pictured, because it is rare enough that I don't have one to photo is the 2000 yen bill. But don't worry, you will probably never see it. In all my time in Japan, I've only see it once. Collectors horde them, so they are rapidly disappearing from circulation. Just as with U.S. pennies, 1 yen coins are mostly worthless. The only difference is they weigh next to nothing so you hardly notice when they are cluttering up your pocket. And just as with pennies, many people save these in jars at home until they have enough to take to the bank to trade in for bills. The 100 and 500 yen coins are kind of nice. That’s roughly a dollar and 5 dollars, again using U.S. money as a comparison. Personally, I find it rather nice and convenient to be able to carry around so much in one small coin. The 100 is about the size of a nickel, and the 500 a quarter, but about twice as thick. There is an older version of the 500 yen coin that is silver instead of gold. This was removed from circulation because it turned out to be easy to counterfeit. However, you will still receive them from time to time. This is just a helpful estimate—be sure to check with your bank for the exact daily rate. Now having said that, a good estimate for Japanese money is 100 yen = 1 U.S. dollar. So whenever you see a giant yen value, just add a decimal point two places in and you will get a good estimate of what that price is in dollars. For example. 23,500 yen is going to be roughly 235.00 dollars. Hope you enjoyed this article about Japanese money. If you spotted any mistakes or just want to say hey, be sure to leave a comment. Thanks for reading! Return from "Japanese Money" to "Japan Facts"